Today was a cozy, rainy day, and I spent it curled up on the couch with a cat in my lap, knitting and watching movies. This scarf was the perfect project for today-- mindless enough that I could keep an eye on my movies, but not mindless enough to be boring. Knit three rows in garter stitch. Repeat the four-row repeat until your scarf reaches the desired length. Hello out there! I decided to try your scarf pattern and so far I love it! I'm not much of a knitter and my yarn isn't nearly as nice as what you're using (just something left over from a sweater I started to knit a decade ago), but the pattern is very pretty and it's coming along nicely. I will link to your blog on my next post (probably tomorrow or Wednesday) and let my 4 faithful readers know to visit you over here. Thanks for posting this pattern. Very pretty - and guess who has some Bonsai!!!! How many skeins did you use for this pattern? thanks! Where can I find the Bonsai yarn? Hi D. Wray-- the Bonsai yarn is made by Berocco and is available online at Yarn Market and Jimmy Beans Wool. This looks lovely, but using 3 skeins... how long does it end up? The Berroco Bonsai yarn only has 77 yards per ball, so the scarf is actually quite short. If you use a different kind of yarn you probably wouldn't need three of them. Hi! I just got some DK bamboo/silk yarn - would this pattern work with that? How would I need to adjust it? Thanks! The DK yarn will work fine for this pattern, but you'll probably end up with a more airy and narrower scarf (nothing wrong with that). 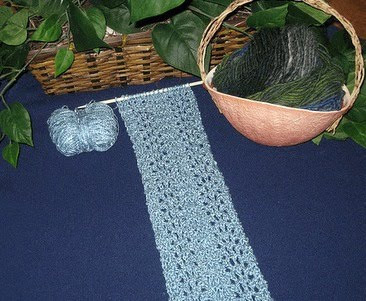 If you want to make the scarf wider, you could add two or three selvedge stitches at the beginning and end of each row. The lace pattern is a 12 stitch repeat, so another way to make the scarf wider is to cast on an extra 12 stitches for a total of 36 stitches. If you do this, you might want to go down a needle size to US 6 so that the scarf isn't too wide. It's up to you. I love that pattern, but I am envisioning a poncho for me...such an easy pattern, and would make a nice, airy, lacy poncho...it beats what I am trying to do now...I just haven't found the bamboo yarn yet, or when I could afford it...this is sooo pretty! Lovely creations on your blog. Thank you for sharing them! What is the multiple of stitches in the pattern in order to make it wider? I like wider shawlish scarves and am putting together some to give away . This pattern is a 12-stitch repeat. If you poke around on the Internet you should be able to find this pattern in an 18-stitch repeat, which might work better for you. Good luck! Hi, I am trying out your lovely pattern, but I am getting stuck on row 3. I follow instructions but I find that I am ending up with more stitches than the 24 I started with. Hello, me again, all it takes is read directions carefully and follow exactly as it says! So... needless to say I figured it out. Hi. I am very excited to try this scarf but I am doing something wrong. I am also getting hung up on row 3. I end up with either too many stitches or not enough? Any ideas what I'm doing wrong? Thank you so much for the pattern!I used 2 different colours- two rows each. I made a wider scarf and joined the ends making 2 sleeves and transforming it into a pretty short jacket. My daughter just loved it! 89Thank you so much for the pattern!I used 2 different colours- two rows each. I made a wider scarf and joined the ends making 2 sleeves and transforming it into a pretty short jacket. My daughter just loved it! I have a nylon/silk yarn, and about four inches is 21-22 stitches... will that yarn work, and what do you think it will look like if i work it in this pattern in size 8 and/or 10 US? Im fairly new in knitting and that's all i have right now. Thank you! It looks very elegant.my friends also appreciated it. I accidentally purchased yarn that is worsted, weight - 3 instead of 4. Can I still make this lovely scarf? Would I need different sized needles? When you do the (YO,K2) part of the 3rd row, Do you return the yarn to the standard side before the K2TOG twice stitches? I love your patterns! especially as I want to knit a scarf for all the women in my family for a reunion in July. 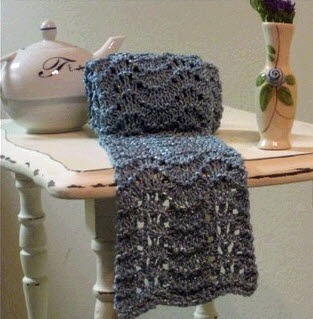 The Simple Lace Scarf is perfect, with size 15 needles... altho I knit loose, so may try it out on a 13.